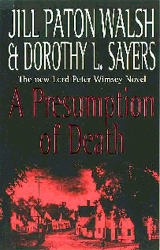 The paperback edition of A PRESUMPTION OF DEATH gave me the chance to talk to Jill Paton Walsh about the latest novel to continue the adventures of Lord Peter Wimsey and extend the "literary life" of Dorothy L. Sayers. Can you give us some background as to how you became involved with the Dorothy L Sayers books? Dorothy L Sayers left an unfinished manuscript which her trustees wished to have finished, and they had an agent who happened to know I was a passionate Dorothy L Sayers aficionado. I got asked, therefore, whether I thought it could be done, I answered I thought it could and they asked if I would do it. A lot of people were trying to find the join but couldn't find it in Thrones, Dominations. It immediately arises, you've done it once, can you do it again? Can you do it again? Well, there is a little material left in her wastepaper basket which is not fiction but it is very interesting. What is was, was letters written as contributions to The Spectator Magazine by way of wartime propaganda to cheer up the British public. It would tell them what Lord Peter was doing, what Harriet Vane was doing and what the characters in the novels were also doing. Rather jokey really. 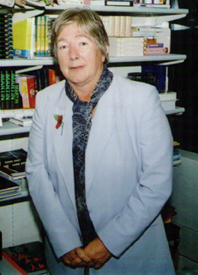 The hated character in the novels is Helen, Duchess of Denver and she has joined something called the Ministry of Instruction and Moral, which is thinly disguised Ministry of Information and that ministry was making itself hated by the British public at the time by bullying them and issuing condescending posters. so you put this bad characters into this hated ministry. Dorothy was playing about like that, using her fictional characters for wartime propaganda. But in the course of doing that she told us what they were doing in 1940. So it's like finding a chess board with the initial moves on the board already made. You can take that on and the game is all to play for. She abandoned her book, Thrones Dominations, her last Lord Peter in 1936. And A Presumption of Death, if you base it on the Wimsey papers, is set 1940. In 1941 the editor of The Spectator suddenly put a stop to it - he didn't like it anymore or something. And so it breaks off abruptly, leaving you knowing what people were doing in January 1940. So you can take it from there, which compulsory fixes the month in which it must be set. Did it make easier for you? It indicates what research you must do, of course. At that time, there was a new news headline pretty well everyday. The British troops were backing up out of Norway and they were walking backwards across France. And things changed every day I had to do quite a lot of historical research to make sure things happened in the right order, and at least roughly the right time. 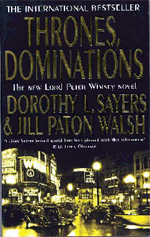 What has been the reaction from the Dorothy L Sayers fan base to you continuing her work? They've been very supportive. I will confess to being not quite surprised but apphresensive when I first began to undertake this. I thought they might be cross with me. But they were most delighted to see Thrones appear, because it rescued the fragment which she had written. They've been tremendously supportive with the new novel. The truth is, they are Wimsey nuts - they can't have too much of Lord Peter. Unless I make a grotesque foul-up, I think they will continue to be pleased. And they do help me get it right. They are learned people. You can ring up Mr Christopher Dean, the president of the Dorothy L Sayers, and ask him things like 'where was the Duke of Denver's town house?' and get an answer. Very, very useful for a struggling author. What is it about this style of writing that continues to appeal to today's readers, where a vast amount around is visceral and hard? I think that the liking for visceral detective stories is not universal at all. There are still a lot of people who like the golden age detection with its concentration on puzzles and its lack of blood and gore. A lot of people like Peter Wimsey as character for other reasons, they are not just interested in him as a detective, they are interested in him as an ideal man. He is witty, he is learned and he quotes things, he laughs, he jokes. The love story between him and Harriet which ran along in parallel to the detection became very absorbing to people. I remember the debate some years ago about that they should not get married, it would be the end of them, where do you stand on this? Interestingly enough that's what Dorothy L Sayers herself thought. When she wrote Strong Poison, that's the first Harriet Vane novel, she thought she would marry him off and get rid of him. But she doesn't say why she thought it would, why she couldn't have a married detective but she thought she would do that. Then she found out that at the end of Strong Poison the prisoner in the dock whom he had just rescued from a hanging, that she realised that no self-respective woman could accept him in that situation. So, in fact, her character refused to accept it. He proposes to her and she says no. And Dorothy realised that that's what her character she created would have done. Then she was stuck and had to go on writing and in fact, in the course of doing this she invented something really interesting and new, which is detection carried out by the means of a conversation between equals. That's not the great detective and his sidekick, not the policeman and his sergeant but two people who are equal with each other and who can talk as equals and they discuss the problems, and the possibilities and the clues together in a way which no other detective story writer had hit upon. There is always a great detective. Harriet, as a writer of detective stories and Peter as an amateur detective are equal, so when they talk about the crime it is very, very absorbing and entertaining. I like writing that very much indeed. You would think that Harriet would get get the upper hand, being a novelist with a furtile imagination. She sometimes makes the useful suggestion, yes. She doesn't actually get the upper hand. Peter is superlatively brainy, double firsts at Oxford and all that stuff. Is it difficult to balance Dorothy L Sayers' style but still maintaining your own voice? Not as difficult as you might think. For two reasons: one is that any competent novelist is a ventriloquist, you have to ventriloquise the characters to be able to bring off voices which aren't yours, otherwise you can't characters; also because I'm now in my sixties and the kind of immaculately correct standard English which I was taught at school, and the language which Dorothy used to write her books which is somewhat my natural mode of talking. It doesn't sound like modern talking at all - I don't sound like my children but I do sound half-way between my children and Dorothy. I don't have to make much effort to sound like my teachers at school, for example, who would have been of her generation. What do you think you've brought to the books? Well, predominantly love. Love of the characters and considerable admiration of the author. Obviously because it is now 2002 you are bringing a different perspective to them; you are seeing them in a different light and help connect them to the modern reading public - I hope. I think I understand Dorothy L Sayers quite well. Obviously I never knew her but I can get myself into her skin. Just as a translator who translates a book from French is asked what have they bought to the book they'd be a bit disconcerted as they didn't mean to bring anything to it, they only meant to translate it. Similarly I don't want to alter her or add to her, I want to make her more accessible to a modern readership. It's obvious even in the first 100 pages that he characters cannot go around behaving as they did in the London of the 1930s What I was trying to do is imagine them in different circumstances, and that is a very interesting thing to do. But it is a little different as the characters move into the war in the current book; they change, the background changes, darkens. In A Presumption of Death, within the first couple of chapters there is a murder and the suspects are all there. 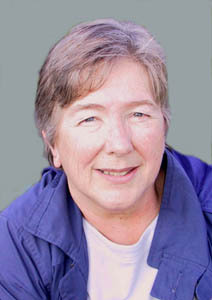 Do you think it is more interesting for the readers to know the how, and not the who or the why that a murder happens? This is very interesting. Dorothy herself said it was important to know the how, when you knew how you knew it was who. And it is in the course of talking about this murder Harriet points out that there is no problem about how, the problem of who is unconnected with how, it's why really. Playing with whodunit, howdunit and whydunit, this is the central game of detection. I think I am more interested than I should be in the why. I can't help it. I try to write the kind of things she wrote but I am always very deeply engaged in why. Have you been asked to continue with the characters and where will they got from here? I have not yet been asked to continue. I think it's possible that I might be. We know where they were in 1943, as Dorothy herself wrote a short story in a collection called Talboys which shows us Peter and Harriet at home in the farm house bringing up their children and there's a problem about someone stealing peaches from Mr Puffit. So, we know they were living in Hertfordshire in 1943 as though it was peacetime. What I'm doing is not making a pier, I'm making a bridge. It has to connect with the story. Do you fear that you might carry over characteristic from either Peter or Harriet into your own work? That's an obvious danger and one which I will look out for. The problem with the Sayers book is to make sure that it is a real living book, that it hasn't been turned into a mechanical little exercise by the difficulties and limitations of it. You know that it is a real book when it begins to have a subject matter of its own which you hadn't quite foreseen. And my own books do that by the by. This time it did indeed happen because there was an unavowed subject in it. Which was old-fashioned patriotism. It was an admiration for the war time generation for what they put up with it and how they managed it, how they found the courage. a recollection of what England was like all those years ago, if you like; before DDT was sprayed on the land, before farming was specialised, to show there was a real country live continuing, an aspect of England I can remember but much has changed in my lifetime and I found that I was really enjoying celebrating this world and those people in the background of the book. Looking back on writing both books how do you view that experience now? It's been an exceedingly interesting experience. It's not like writing my own fiction; it's not like being a kind of imaginative biographer. There is no such literary form as imagined biography; I seem to be doing something rather new. Because the characters have so much reality in other people's minds, they're immensely popular characters, that gives them a realism as though they are people I have met rather than people I have made up in my head. And when they talk to me in my head, they don't talk to me in the same way as they would if I had other resources. I find working with them, therefore very interesting technically. It's different and difficult. I like the difficulty because it rather challenges me a bit. I find it enjoyable and fruitful, it might help me when I return to making characters if my own.